From canapés to multi-course seated dinners, Jeeves creates one-of-a-kind, seasonal menus that embody our clients’ sensibilities and needs. Unpretentious, inspired food, served up with a lot of love and personality is what comes out of the Jeeves kitchens and onto the guests’ plates. We begin by listening to you and designing an event specifically for you and your guests. Everything we serve is made from scratch - from our homemade mustards and wild fermented pickles to fresh and exotic cocktail mixers. Since eating locally produced foods is better for you and better for the planet, Jeeves uses locally sourced, seasonal products, whenever possible. Our menus are simply a starting point in planning your event and will be customised to suit your tastes, needs and budget. But our catering is about more than just delicious food. From hand-selecting a professional and friendly staff, to making sure the tables are set just right, to being able to recommend the perfect wines to go with your food selection, Jeeves offers the complete catering service. With a team of highly proficient event organisers, and with more than 20 years of experience in offering special event catering services and party planning, we will make your private party an impressive event. As a leading locally based corporate events caterer, Jeeves has been employed by an array of businesses, from blue chip companies to local boutique businesses to educational establishments. Indulge in a selection of finger sandwiches with traditional fillings and mini Devonshire scones filled with clotted cream and raspberry jam. Be seduced by the vanilla shortbreads, summer fruit jellies and the dainty iced cakes. 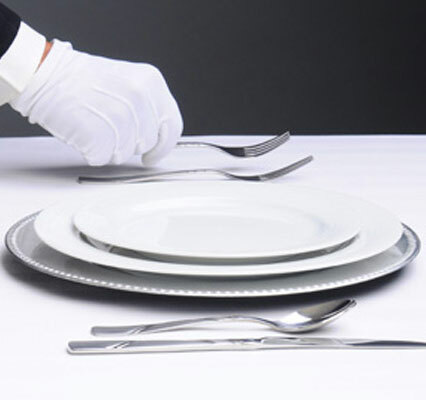 Our All-inclusive Dinner Parties Include table linen, white china tableware, cutlery, glassware and staffing costs which includes setting up previous day if necessary and up to eight hours service on day of event. This price is for venues within a 25 mile radius of Peterborough and Stamford. We are happy to discuss a quotation for locations within a 100 mile radius of Peterborough and Stamford. We can also help you with all aspects of your event planning: marquees, flowers. cakes, photography, venue dressing, stationery, cars and entertainment.